What do you do to help a student who worries all the time and has persistent fears? How do you help the child whose extreme mood changes interfere with learning? Are you challenged by kids who are overly aggressive or defiant? And what do you know about dealing with ADHD, OCD, NVLD, GAD, PTSD, communication disorders, Asperger’s Syndrome, eating disorders, learning disabilities, autism, and social phobias? Without a doubt, you are teaching a wide spectrum of students in your mainstream classroom. It’s estimated that ten million young people deal with challenges that make it difficult for them to learn or behave appropriately in the classroom. 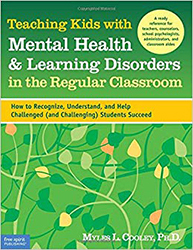 This includes up to 10 percent of students in the regular classroom who have a learning disability, and 20 percent who have a mental health disorder that interferes with daily life. Given the many challenges you face each day, this essential teacher resource can help you address students’ special needs.